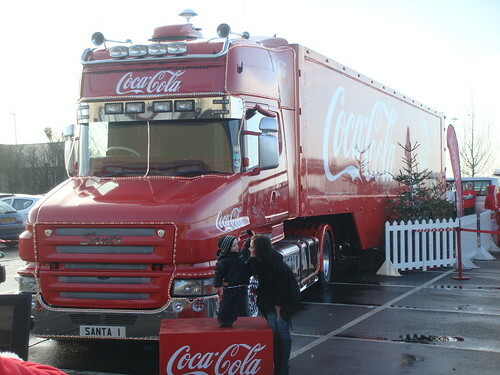 I had a tip off this week that a Coca Cola Christmas truck would be making an appearence today at my local Sainsburys in Colchester. The store is about 500 yards from my house so I thought i’d pop along and get a snap afterwork only to be reminded by Mrs Blogger that I am out this eveing and won’t be coming home til after the truck has left. 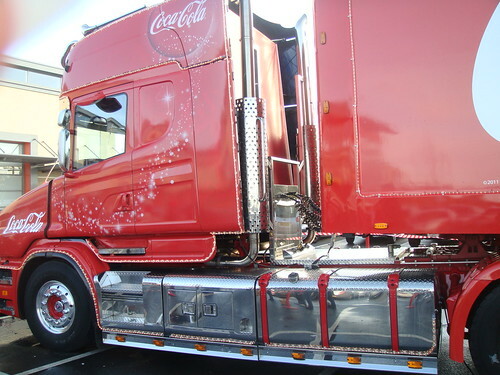 The photo above is one of 2 trucks on the Coca Cola Christmas truck tour. For full details of what stops are left on the tour, click HERE to go to the tour map. I would just like to say I do not know the people in the photo, they must have been next tin line to have their photo taken with the truck. Yesterday I saw a photo on Facebook of the 2 trucks parked together and being an eagle eyed truck spotter I noticed the 2 registration numbers; V8 GNC and BU03 ZVC. 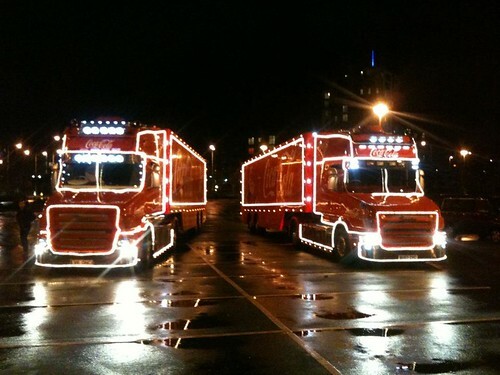 To some of you they might not mean a lot but i recognised them to be Coles & Sons of Banbury’s, 2 Scania T-cabs. So after a little insider knowledge (thanks to a certain ex T-cab driver) he confirmed my suspictions. Crikey! 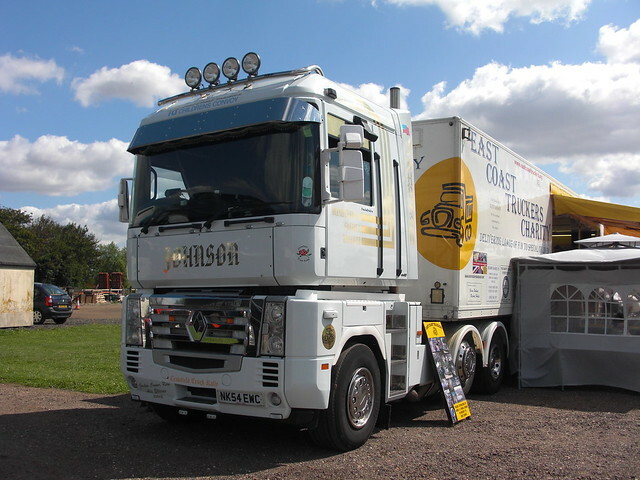 Can you imagine it, 2 of the best know airbrushed trucks in the country, V8 GNC being the one covered in artwork from the film Convoy. 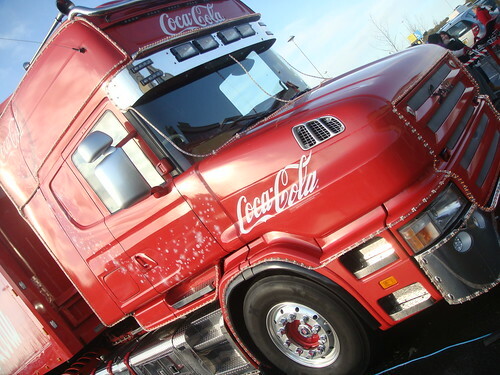 How Gary Coles plucked up the courage to have cab wrap applied to his pride and joy i’ll never know (but I have a rough idea!). 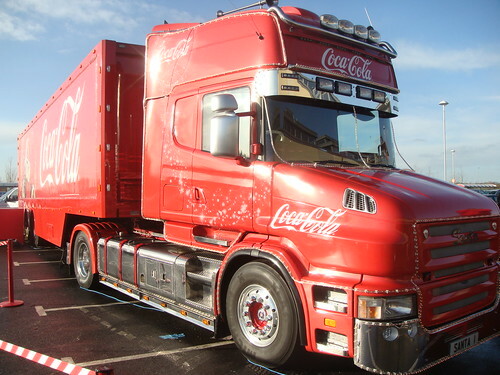 I think more importantly put yourself in the shoes of the poor chap who’s task it will be to “un-wrap” the trucks at the end of the tour…..Good luck and a steady hand required me thinks!! 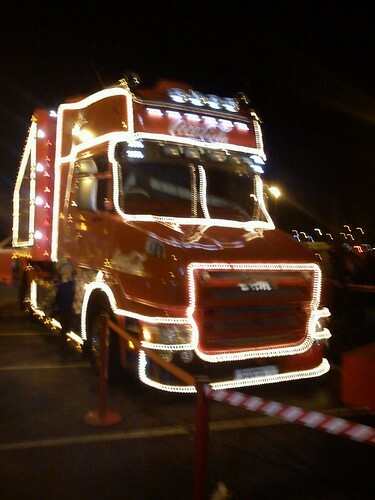 Any way the trucks are covered head to toe in lights, just like the Americn trucks on the now legendary TV advert. I have to say they look quite good and judging by Mrs Bloggers comments, there were plenty of happy kids at Sainsburys this evening. 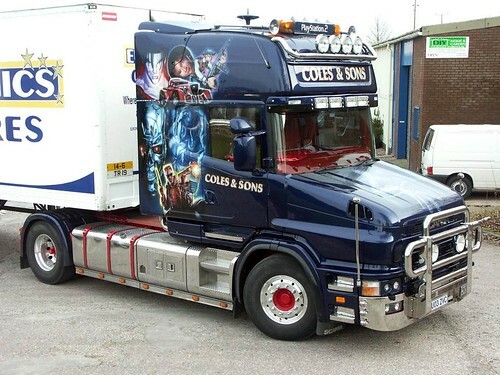 For those of you who are even sadder than me, just to confirm that the trucks are Coles & Sons and have only been cab wrapped and not resprayed the only evidence I can supply is this rear view of the cab. If you look carefully, the panel between the stacks and the cab looks like a temporary arrangement and also you can still see the lovely blue of Coles trucks on the side air deflector. 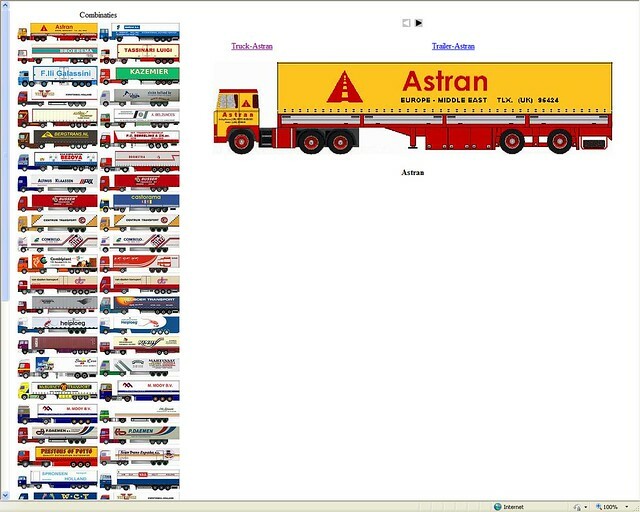 I guess it’s just to much faff to try and cover the honeycombed back of the Scania side deflector, fair play. 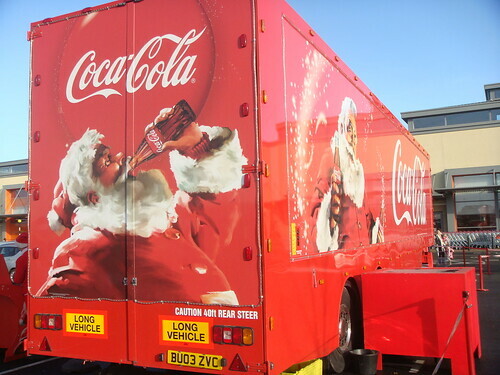 The truck looks great and is fairly certainly bringing plenty of Christmas cheer to Supermarkets all over, just another treat / way to wind your kidies up before Christmas. Once again spare a thought for the un-wrapping man, i guess how well he does will depend if the trucks do the same again next year! !